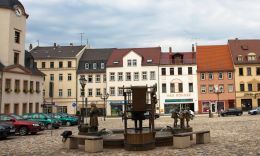 The district town Glauchau is nestled in the Erzgebirge Basin on the banks of the river Mulde and has around 24,000 inhabitants. In the 12th Century were the dynasty of Schönburg build a castle. Since then Glauchau boasts a colorful history. To wealth and fame made it Glauchau beginning of the 20th Century, during the flowering of the textile industry. From weavers and manufactures a small industry has developed with Spinnerein, Weberein and finishing mills. Still dominating the residential area of the city Glauchau. The most famous son was Georgius Agricola. 1494 the mineralogist, doctor, politician, teacher and historian, was born in Glauchau. More about Glauchau can be found at: www.glauchau.de.